Use Faraday rotation isolators from Micro Harmonics to suppress standing waves in your systems. Our Millimeter Wave Isolators have the lowest insertion loss in the industry and are the perfect choice for sensitive millimeter-wave instrumentation. They employ unique diamond heatsinks for cooler operating temperatures and improved power handling. They are 100% made in the USA and can be sole-sourced in US government acquisitions. Our millimeter wave isolators (mm wave isolator) employ a modern design yielding much lower insertion loss than most commercial products. They also work over broader bandwidths in excess of standard waveguide bands. But there is another important difference that sets them apart from conventional products. Our millimeter wave isolators employ a diamond support disc that channels heat to the block and thus they can handle greater reverse power levels. To our knowledge no other commercial millimeter wave isolators offer this advantage. At the heart of a Faraday rotation isolator are a pair of alumina cones and a cylindrical ferrite core. The cones are used to couple EM fields from the waveguides to the ferrite. The cones are bisected by a resistive layer along their central axis. In most commercial Faraday rotation isolators, the ferrite and cones are suspended by a pair of washer shaped supports as shown in the sketch below. The cone/ferrite assembly is inserted through the inner holes in the supports and then attached with a non-conductive epoxy. The support material is typically BOPET, polyimide, styrene, a resin or some other material with a low dielectric constant and low loss at millimeter wave frequencies. Materials with these characteristics are generally in the class of thermal insulators and thus the cones and ferrite are thermally isolated from the metal waveguide block. Power entering the output port of the isolator is absorbed in the resistive layer bisecting the input alumina cone. The absorbed power is converted to heat energy. Very little of this heat energy can be channeled away by thermal conduction through the supports, rather it must be dissipated through a radiative or convection process. The resistive layers are thus subject to high heat levels and even damage. Historically this was not an issue as there was very little power available at these frequencies. But as higher power sources are becoming available there is a renewed interest in the power ratings of these devices. At Micro Harmonics we have replaced the input support washer with a uniform highgrade optical CVD diamond disc. Diamond is the ultimate thermal conductor approaching 2200 W/mK, more than five times higher than copper. The graphic below shows an exploded view of the millimeter wave isolator core to give a better view of the constituent parts (ferrite, cones, supports and absorber). 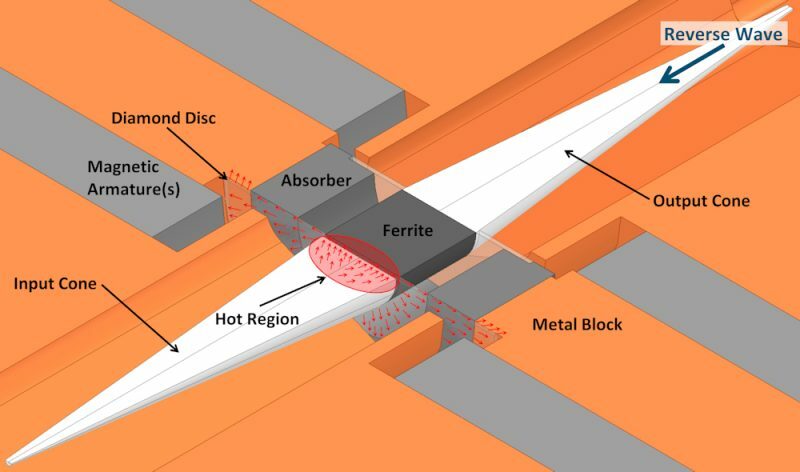 The absorber inhibits exitation of higher order modes in the highly over-moded cavity. The diamond disc is sandwiched between the base of the input cone and the ferrite (left most support disc). The diamond disc is in intimate contact over the entire area of the cone base as shown in the graphic below. This is the optimal location since it is the region subject to the highest heat levels. 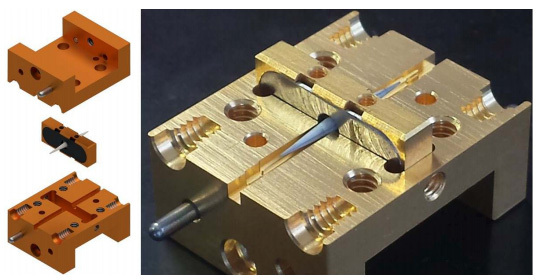 The assembled isolator core sits in a machined waveguide block as shown in the graphic below. The waveguide block and isolator core are split in half to allow a view of the interior. Magnetic armatures are also shown in the sketch. The armatures are used to focus the magnetic bias field from rare earth magnets onto the ferrite. The diamond disc is attached to the metal waveguide block over its periphery. 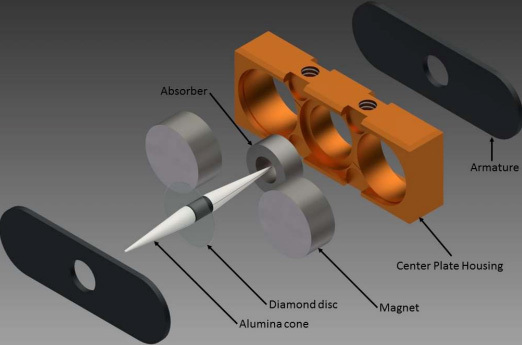 The diamond is in intimate contact with the input cone and the metal waveguide block and thus it provides an excellent conduit to channel heat away from the resistive layer. The red arrows indicate the path of heat flow. Even at low reverse power levels, our millimeter wave isolators should consistently run cooler with reduced thermal stress on the resistive layer and epoxy joints. 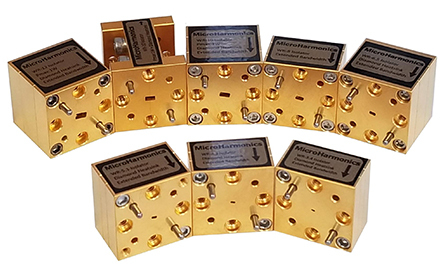 Micro Harmonics has developed a Faraday rotation isolator that can be integrated with other components in a single waveguide block. The drop-in millimeter wave isolator comprises a centerplate that houses the core assembly (ferrite, cones, absorber, magnets, armatures) and an E-plane split waveguide block that houses the centerplate and provides stepped waveguide twists on both the input and output ports. An exploded view diagram of the centerplate assembly is shown. The next graphic shows how the centerplate assembly fits into the E-plane split waveguide block. On the righthand side is a photograph showing a centerplate assembly sitting in the base half of the E-plane split waveguide block. The features of the machined twist step are visible in the photo. The graph shows measured data from one of our WR-10 drop-in isolator prototypes. 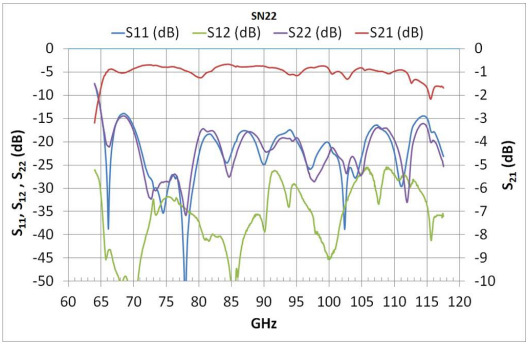 In the standard WR‑10 band from 75-110 GHz, the insertion loss is less than 1.3 dB, the isolation is greater than 25 dB and the input and output return loss is less than 17 dB. The insertion loss is less than 1.5 dB over the extended band 66-115 GHz and isolation is greater than 25 dB over the extended band 64-117 GHz. The drop-in isolator offers some unique advantages. First, it can be integrated into a larger waveguide block. Second, the waveguides on the flanges are perfectly aligned in the drop-in isolator whereas in our standard isolators the waveguides are canted at 11.25 degrees from normal. Although this difference is mostly cosmetic, it may be important to some users. Third, the drop-in topology makes it possible to access two of the waveguide flange screws on each flange from the block interior which can eliminate the need for interconnecting waveguides. Our drop-in millimeter wave isolators are sold and shipped with the centerplate assembly housed in the outer waveguide block. This provides protection of the centerplate assembly and allows the drop-in isolator to be tested and used as a standalone component. If the customer wishes to integrate the isolator into their system, they can remove the outer housing, return it to micro Harmonics and receive a reimbursement. Micro Harmonics will provide customers with detailed drawings for the stepped twists and other features necessary to incorporate the drop-in millimeter wave isolator into their system. All of the required machine features including the stepped twist transitions are produced using standard end mil cuts. Currently, the drop-in millimeter wave isolator is only available in W band (75-110 GHz).